The wine country has really changed over the years. Tastings use to be free, not they cost quite a bit making a day trip really expensive. 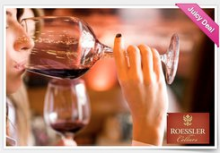 If you are planning a trip to Sonoma, you’ll want to grab this tasting deal and stop at Roessler Cellars winery! This deal from Juice in the City includes a PRIVATE on hour wine tasting of five wines in the Roessler collection. The best part of this deal? It’s only $10! Head over to Juice in the City and select your location to view this deal and others like it. . It’s free and easy to sign up! Make sure you â€œLikeâ€ Juice in the City on Facebook or follow @juiceinthecity on Twitter so you don’t miss out on future deals! Daily deals Aug 4, 2011 in entertainment, JITC, Winery · Expired!